Shrub or tree to 6(–10) m high. Bark fissured, flaky-fibrous, grey or brown. Branchlets sharply angular, reddish, glabrous or sometimes slightly scurfy. Phyllodes very narrowly to narrowly elliptic, +/- straight to falcate, 7–18 cm long, 7–35 mm wide, broader in juveniles, with 3 or more longitudinal veins more prominent, the lower 2 confluent with each other near base, the minor veins 4 or 5 per mm, anastomosing; gland 1, basal; pulvinus 2–4 (–5) mm long. Spikes 3–10 cm long. Flowers 5-merous, pale yellow or sometimes yellow; calyx 0.5–0.9 mm long, dissected to 1/4–1/5, glabrous or almost so; corolla 1.5–2 mm long, dissected to c. 2/3, glabrous, papillate at apex; ovary tomentose. Pods linear, slightly constricted between the seeds, mostly curved, openly coiled or twisted, 4–15 cm long, 2–4 mm wide, coriaceous, longitudinally striate. Seeds longitudinal, broadly elliptic, 2.5–3.5 mm long, black; areole open. Occurs in Qld and N.S.W. from the northern Burdekin Basin to the Sydney district, common and widespread in eucalypt woodland especially on well-drained, shallow soils. 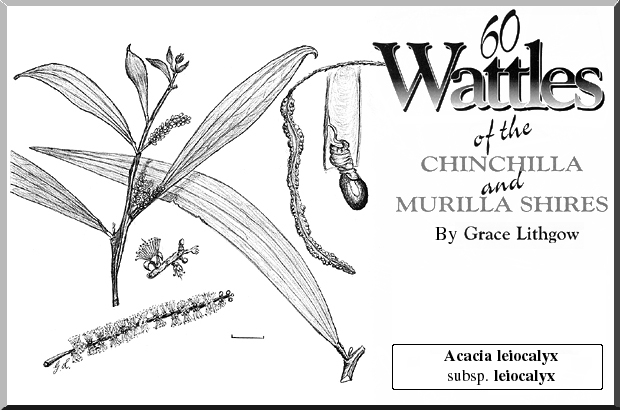 A c acia leiocalyx is a member of the 'A. cunninghamii group' and is most closely related to A. concurrens , where the differences between the two species are subtle. In A. leiocalyx the branchlets are smooth, sharply angular and usually red-brown, the pulvinus is short and red, and the calyx is glabrous or almost so. Acacia concurrens on the other hand has stouter, angular branchlets which are scurfy and usually not distinctly reddish, a long grey-green pulvinus, and calyces with a few stiff short hairs towards their base. Some intermediates or hybrids between the two species occur in northern N.S.W. Also related to A. crassa . 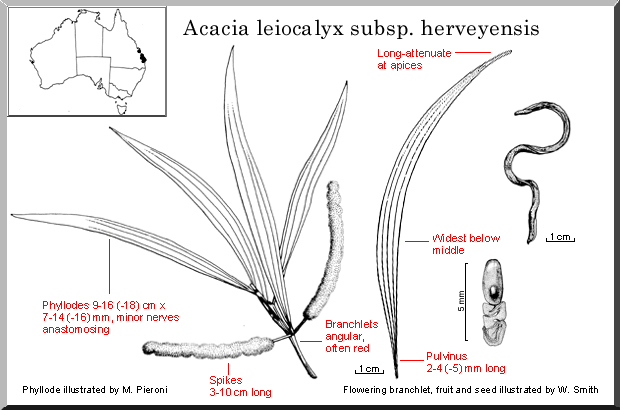 Three new Qld species related to A. leiocalyx were recently described by L.Pedley in Austrobaileya 5(2): 307–321 (1999), namely, A. burdekensis , A. faucium and A. fodinalis . Acacia tingoorensis has affinities with the above species. See also A. longispicata . 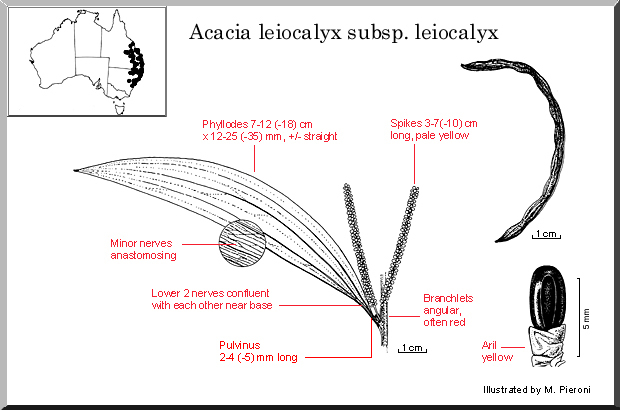 Details of ecology of A. leiocalyx in Qld are given by E.Anderson, Pl. Central Queensland 29 (1993). Phyllodes 7–12 (-18) cm long, 12–25 (-35) mm wide, 4–9 times as long as wide. Occurs in Qld from Burdekin R. region, on the coast W to about 147 E, and in north-eastern N.S.W. S to the Sydney district and W to the Narrabri district. Grows in eucalypt forest, woodland and heaths, in sandy or clayey soils. Flowers mid-Apr.–July in coastal Qld, late Apr.–Aug. in inland Qld, (May–)June–Sept. in N.S.W. Subspecies leiocalyx differs from subsp. herveyensis in having generally broader phyllodes and (at least in coastal Qld areas where subsp. herveyensis occurs) flowers earlier in the season. Prope Brisbane R., Qld, A.Dietrich 568 ; lecto: PR; iso: HBG n.v. , NSW. Acacia glaucescens var. leiocalyx Domin, Biblioth. Bot. 89: 269 (1926); Racosperma leiocalyx (Domin) Pedley, Austrobaileya 2: 351 (1987). Type: as for accepted name. E.R.Rotherham et al. , Fl. Pl. New South Wales S Queensland 53, pl. 127 (1975); B.A.Lebler, Wildfl. 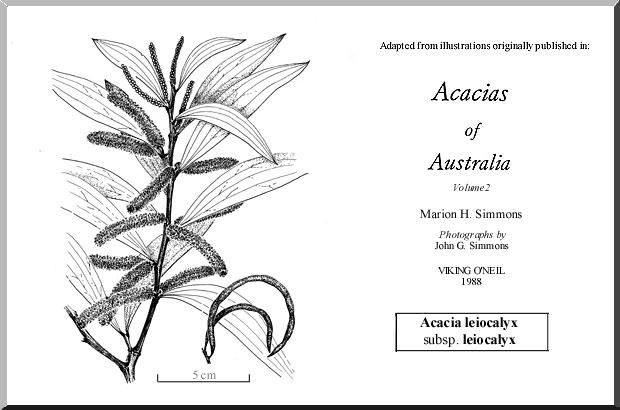 SE Queensland 26 (1981); M.Simmons, Acacias Australia 2: 261 (1988); T.Tame, Acacias SE Australia 31, fig. 3, pl. 3 (1992). Qld: on Ban Ban Springs–Gayndah road, 72 km by road from Biggenden towards Gayndah, S.J.Davies 59 & J.M.Powell (AD, K, MEL, NSW, PERTH); 4 miles [6.4 km] WNW of Chinchilla, M.D.Tindale 716 (AD, CANB, K, NSW); 2 miles [3.2 km] S of Murgon, 31 Oct. 1960, M.D.Tindale (NSW). N.S.W. : 3.7 km S of Corindi, R.G.Coveny 4261 & J.Armstrong (A, AD, BRI, CANB, G, L, MEL, NSW, TNS, UC, US); 2.4 km SE of Kempsey, K.Thurtell & R.Coveny 3835 (A, AD, CANB, CHR, K, L, LE, MEL, PERTH, RSA, U, US). Phyllodes 9–16 cm long, 7–14 (-16) mm wide, 8–16 (-19) times as long as wide. Occurs in eastern Qld from Yeppoon SE to Fraser Is. and S to Gympie; it is sympatric with subsp. leiocalyx in the Gympie-Maryborough area. Grows on sand in beach scrub or on clay soils in eucalypt forest. Flowers from July to Sept.
Mullet Ck, Qld, Aug. 1969, L.Pedley 2867 ; holo: BRI. Qld: Boonooroo, D.Boyland 1507 (BRI); 20 mi [32 km] SW of Double Island Pt, S.L.Everist 7856 (BRI); Arthurs Lookout near Round Hill Head, L.Pedley 2873 (BRI, NSW).